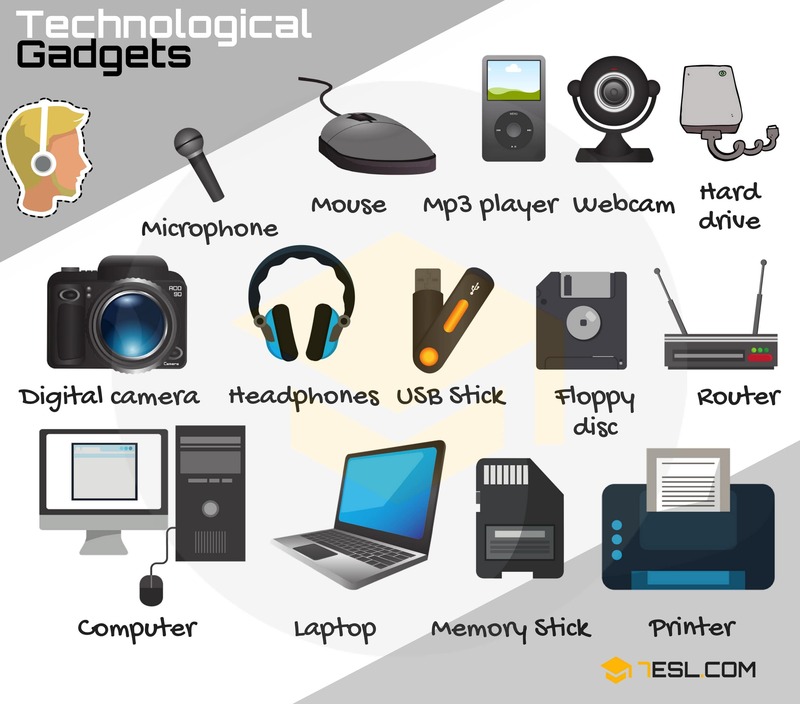 Learn technological gadgets vocabulary in English to expand your vocabulary. A gadget is a small technological object (such as a device or an appliance) that has a particular function, but is often thought of as a novelty. A microphone, colloquially nicknamed mic or mike is a transducer that converts sound into an electrical signal. Example: We need a microphone so that people in the back can hear us. A mouse is a small rodent characteristically having a pointed snout, small rounded ears, a body-length scaly tail and a high breeding rate. Example: You can move the cursor by using the mouse. An MP3 player or Digital Audio Player is an electronic device that can play digital audio files. Example: I loves listening to the music via Mp3 player. Example: You could even watch her on the webcam. A hard drive or fixed disk is a data storage device that uses magnetic storage to store and retrieve digital information using one or more rigid rapidly rotating disks (platters) coated with magnetic material. Example: You’ll need to upgrade your hard drive to 4Mb before running this software. Example: He’s just bought a new digital camera. Headphones (or head-phones in the early days of telephony and radio) are a pair of small loudspeaker drivers worn on or around the head over a user’s ears. Example: I had my headphones on so I didn’t hear Tom enter the room. Example: I can boot up from a floppy disk, but that’s all. Example: His latest toy is a personal computer.